Our mission is to nurture young minds through a sound educational programme which is sensitive to the multicultural ethos, so as to create caring and socially responsible individuals. The school promotes and ensures that each student has ample opportunities to be an impressive communicator, a keen inquirer and one who enhances his/her academics, social and sporting skills, thereby developing into a well- balanced personality. This language policy is a working document developed by Principal, academic coordinators and faculty from each school programme (IBPYP, IGCSE and IBDP). The policy is consistent with the stipulated principles and practices of IB and CAIE. This document outlines our school’s linguistic and academic goals and defines the programme designed to help our students attain these goals. This policy is intended to provide an overview and guiding principles for language learning at AGS, Gurugram which permeates the entire school curriculum through authentic contexts in a culturally rich and diverse environment. Our policy is a statement of agreement—one to which the staff and AGS community are committed to achieve. At AGS, we recognize that all teachers are also language teachers who have the responsibility to facilitate language acquisition and promote communication skills through their grade level and content area classes. The pedagogical attributes of the IBPYP, CAIE and IBDP as well as guiding documents are taken into consideration for this policy. At AGS, we believe language is a vital tool for learning, communicating and being an active member of a global society. As communication in the world changes, we have the responsibility of supporting our students to be multilingual learners. Language opens the mind and presents opportunities that will cultivate internationally-minded citizens. We believe language acquisition is best supported by a language-rich environment which includes books, periodicals, prints, online resources, and teacher and student writing. Teachers are role models for using and learning language and can foster a positive attitude towards language and literature. Language is the major connecting element across the curriculum. Therefore the focus is on not only language and literacy, but also on its application. Language is not perceived as individual content area. The integration of knowledge, skills and strategies of languages enables students to solve problems and think critically and creatively in all subject areas. English is the language of instruction at AGS. Literature is an integral part of the curriculum. By learning language as well as learning about and through language, an appreciation of the richness of language and a love of literature is nurtured. Books are carefully selected to reinforce learning and the development of reading skills, as well as to reflect various cultural aspects. Students learn how to understand, interpret and respond to the ideas, attitudes and feelings expressed in various texts. Books are read for enjoyment and can also be discussed, analyzed, compared and contrasted. Students learn how to understand, interpret and respond to the ideas, attitudes and feelings expressed in various texts; to think critically about what they read; and to be able to make predictions and inferences based on information that is both explicit and implicit in the text. Scaffolding and extension in language learning are strategies adopted to differentiate and challenge students. Language learning at AGS extends beyond the classroom and has close connections to the resource centers. Teachers and students both use the library, ICT labs and varied tools to enrich their language learning as well as learning in other subject areas. The classroom environment is rich in print and literature to equip students with the tools they need to become lifelong readers and writers who can communicate their thoughts. Teachers act as facilitators who model writing, reading strategies, listening skills and appropriate speech. Oral language-At AGS, students come from different cultures and backgrounds and strive to demonstrate conversational accuracy. Teachers value hands-on experiences in order to reinforce primary and secondary language in addition to the classroom. Through oral presentations, skits, songs, debates, stories, reading aloud, assembly, etc. students become enthusiastic and open minded about other cultures. AGS will provide ample opportunities for students to learn unique ways to communicate with each other. Language as a common practice opens doors to a life time of open mindedness and an appreciation of learning. Writing- Writing across the curriculum is a significant activity across all grade levels. The writing process involves creating an environment where students can acquire the skills necessary to produce written products for a variety of purposes. The written product can be informative, persuasive, poetic, or in the form of a story or dialogue. When learning to write, students are encouraged to focus, at first, on meaning rather than accuracy, and to enjoy the writing process. Children from non-English speaking background who need support in English are offered ELS classes. These classes aim to support these students to learn English and support language development in all subject areas. The faculty and staff are all accountable for communicating our support of mother tongue languages. We feel that students and parents who speak another language bring an added perspective to learning. We value their views and encourage them to share. We utilize their knowledge as resources and guest speakers. Our library is building resources on books in the home languages of all our students and continues to look for more resources to support both second language acquisition and other mother tongue languages. As the language programme develops, we will seek more opportunities to highlight and support other mother tongue languages. The focus of language and its application is across subject areas and throughout the transdisciplinary programme of inquiry (POI). Language provides a vehicle for inquiry. The POI provides an authentic context for learners to develop and use language. Wherever possible, language is taught through the relevant, authentic context of the units of inquiry. The PYP language scope and sequence document identifies the major expectations considered essential in language learning. ELS is offered to support students of non-English speaking background to learn English and support language development in all subject areas. They attend 40 minutes classes five times in a week. They will merge into the mainstream classes after an assessment of their language development. Differentiated learning is practiced for these students in the classrooms. Hindi is not offered to them when they are getting ELS. ELS teachers plan with the homeroom teachers. Students of Nursery through grade 5 at AGS, have Hindi classes every day for 40 minutes. All students of Nursery learn the language with their homeroom tutors. From KG to grade 5, Hindi classes are taken by Hindi teachers. Students’ progress in Hindi is continually assessed. Students from countries other than the host country, India, learn about its culture. They learn about the people, traditions, music, history, and customs of India, students discover what is unique about India, and what we have in common with their countries. This leads the students to the appreciation that the world is enriched by its many cultures. AGS has several support services available to help students in their language development. Students who need additional support or an early intervention are discussed in a meeting by the homeroom tutor first with the PYPC and then with the SEN department and Principal. These meetings include classroom teachers, special education teachers, parents and support teachers. The team works together to develop a plan to help the student become successful by setting goals and monitoring progress towards those goals. SPECIAL EDUCATION- Students who need Special Education services are supported by the classroom teacher and Special Education department. The special education teachers and the classroom teacher work hand in hand to implement the student’s IEP. All services are provided with consideration to the least restrictive environment, considering first providing support within the student's classroom if appropriate. Teachers work closely with students to provide depth, complexity and enrichment in all areas of learning. LIBRARY-The librarian collaborates regularly with teachers to support the students’ needs. She provides research support, book selection and acquisition of resources. The students are active participants in reading programme in English (ORT-Oxford Reading Tree) and Hindi. Differentiated reading and continued assessment through reflections, vocabulary building, language development are elements of the reading programme supervised by the homeroom tutors and Hindi teachers. This programme involves the participation of parents. Parents are also invited to read and share stories with students in relation to the ongoing units of inquiry. Programmes are being implemented in the library to expose students to a variety of literature in different genres. Author of the month is one such programme. TECHNOLOGY-Students have access to a wide range of technology that supports language development. Laptops, iPad, cameras, webcams, smart boards and projectors all help students compose, share and connect ideas. Software includes word processing, presentation, graphic organizing, photo editing and illustration. Students are assessed in their development of oral language, written language, and visual language including viewing and presenting. While the end product is often assessed as an indicator of growth, the process is also vitally important and informally assessed. Students are given feedback based on both their growth towards individual learning goals and through formal reports at the end of each term. Regular meetings are held with parents, individually, and through parent teacher meetings scheduled in the school almanac. At AGS, English is the language of instruction and the medium through which students access learning and communicate their understanding in all subjects. At AGS in order to cater to the needs to multi- cultural students and encourage Indian students to learn foreign languages as prospective Global citizens, from Grade 6 to Grade 10- students have the options to choose from Hindi, French, Spanish and German. Furthermore the learning of languages through the provision of language curricula for English speakers learning foreign languages and for non-English speakers learning English, in IGCSE English is offered both as First Language English as well as English as Second languages. We support multilingualism by promoting other languages including mother tongues, by allowing candidates to opt for the study of self-taught languages and take the examination either in O level or IGCSE level wherever it is available. In Grades 6-8 study of Host Country Culture has been initiated to encourage foreign students and non- Hindi speaking students to learn Hindi so that they are able to communicate with others, understand India’s culture and heritage and be comfortable in a foreign country. Every teacher is a language teacher-Every teacher uses strategies to be ‘language aware’ and to plan language support in their classes. Use of English to English dictionary (non-digital) is used during lessons or examinations-except language exams. English Language Support classes are time- tabled for those students who have been assessed for ELS needs. Ongoing feedback is given on the progress of the child. At AGS, to maintain high standards of academic rigour, Summative Assessments are held every Thursday. In order to reiterate learning and encourage students to be active learners students are assessed on class assignments, research work and presentations. • To prepare students adequately for higher studies at various English speaking universities. ELS classes are held for students who need assistance and practice to be able to use English effectively. These classes are timetabled five times a week and additional support is given in individual cases. They are merged into the mainstream classes after an assessment of their language development. We offer English as Language A to the Diploma Program students as Indian students are exposed to the English language from the early years both at home and school. English is one of the best known languages to most Indians. The prescribed course aims to introduce the students to a range of literary works of different genres, periods, styles and contexts. The study of works from different cultures and languages will introduce the students to the interdependence of culture on language and vice-versa. It will also enable the students to appreciate the art of fine writing. Language A is offered at both Higher Level and Standard Level. The course aims to promote interest and depth of reading among students. Reading will in turn promote fluency and precision in speech and writing enabling effective use of the language. Self-taught Languages: Students are allowed to study his/her mother tongue as a self-taught language (Standard level only). The school and DPC provide the support when required. Diploma candidates who choose to study a new language are offered French, Spanish and German at standard and ab initio level. The course aims to provide students with an ability to deal with everyday communication and provides them with an insight into the culture of that country. AGS makes use of quantitative and qualitative assessment strategies and tools that provide opportunities for peer and self-assessments. • in the development of the curriculum according to the principles of the programme. The recording and reporting of individual levels of achievement are organized in ways that provide students with detailed feedback on their progress as it relates to the assessment criteria for each subject group. The assessment reports are also placed in the school’s secure network. Each subject has different criteria which are the conditions that must be met for an expected result. Criteria generally include knowledge, understanding, skills and presentation. Teachers organize continuous assessments over the course of the programme according to specified assessment criteria that correspond to the objectives of each subject group. Task specific rubrics are prepared in accordance with the grade descriptors given in each subject area. During a term, there will be two cycles of Summative Assessment for each subject and a Term End Assessment. Term End Assessments are given at the end of each term; in December and May. Assessment dates are mentioned in the AGS Calendar. Students appearing for IBDP examinations in May take Mock Exams in February- March. Applicants are required to complete a Student information form that indicates their proficiency in their mother tongue, English and other languages. In the Primary, Middle and Senior Schools, any application for a student who indicates that English is not their mother tongue will be reviewed by the ELS department as part of the admissions policy. Parents are an integral part of our community of learners and are encouraged to provide support for language learning at AGS. The school uses multiple methods to communicate to parents the critical importance of maintaining academic proficiency in the mother tongue. Parents are involved as mother tongue teachers and provide resources for mother tongue programmes. Students, parents and staff members at AGS originate from different countries and educational systems. To maintain consistency in published materials, British English spelling will be used for our formal written documentation. However, teachers and students may use their native country’s spelling and punctuation for all other work provided it is employed consistently throughout the document. The language policy will be introduced to the AGS community through multiple pathways including staff meetings, PTM, grade level meetings and Principal’s News, Orientation programmes and IB Information sessions. The policy will also be featured on the common server. New staff will be familiarised with the document during orientation. The Pedagogical Leadership Team accepts the responsibility for ensuring the language policy is put into practice. Teachers and administrators will communicate language policy to parents, and posted on the school website. The Leadership Team will regularly evaluate implementation of language policy as evidenced by classroom observations and school presentations. AGS Language Policy will be reviewed every three years or earlier as needed by the Language Policy Steering committee and pedagogical leadership team. The assessment policy is a working document developed by Principal, academic coordinators and faculty from each school programme (IBPYP, IGCSE and IBDP). At AGS , Grades pre-nursery to 5 follow the IBPYP, Grades 6 to 10 follow CAIE and grades 11 and 12 IBDP. The policy is consistent with the stipulated principles and practices of IB and CAIE. Assessment at Amity Global School, Gurugram involves collecting and analyzing assessment information which is used to drive instruction and to communicate effectively with stakeholders within, as well as outside of, the community. AGS Assessment Policy serves to guide and inform the staff, parents and community of the school’s assessment practices. Student learning is promoted through planning and refining the teaching and learning process through assessments. Summative assessments give teachers an insight into students’ understanding at the culmination of a learning process. Formative assessments provide teachers with understanding to plan and promote further learning. Assessment will be reflected upon and should effectively guide students through the PYP five essential elements of learning - the acquisition of knowledge, understanding of concepts, mastering of skills, development of attitudes and decision to take action. All stakeholders should have a clear understanding of what is being assessed and why;the methods used to assess; and the criteria of success for each type of assessment. Reflection is integral to assessment in the Primary school at AGS as it enhances student learning throughout the Programme of Inquiry, as well as the teaching of learning objectives. 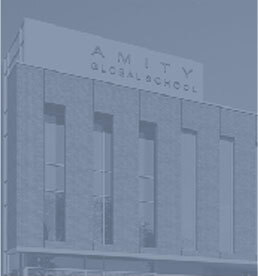 Amity Global School, Gurgaon, provides meaningful feedback consistently to students, parents and community members through parent/teacher/student interviews, student-led conferences, and report cards. PYP Exhibition is the culminating experience for the IB Primary Years Programme. It requires students to synthesize their prior knowledge and to apply it in a self-directed manner. The Exhibition provides an authentic summative assessment for the PYP years. The subject of the Exhibition is a student-selected, real-world problem which warrants an extended investigation. It is a celebration which unites students, teachers, and families in an activity which represents the essence of PYP- Transdisciplinary skills embedded with the IB Learner Profile and attitudes. Exhibition is undertaken by students in their final year (Grade 5) of the PYP. The Exhibition represents a significant event in the life of our school, encapsulating the essence of the PYP and encouraging younger students to look forward to their final year of the programme and their future participation in the community at large. Assessment has a number of purposes that are essential to the education process.These include assessment for learning (providing feedback in support of the learning process) and summative assessment ( determining a learner’s level of development. Assessments inform schools and the learners about their depth of understanding and their acquisition of specified subject skills. Assessment of specific and transparent educational standards enables the benchmarking of learner achievement on an international scale. Educational standards are referenced to criteria which relate to the objectives of students’ learning. Assessments are planned and designed alongside the curriculum and particular attention is paid to ensure that all assessments are valid, reliable and fair. At AGS, to maintain the high standards of academic rigor weekly summative assessment are held every Wednesday. In an academic session 2 summative assessments are held between July and December and 1 between January and April. Beside these we have term end assessments in December and May. The students are encouraged to appear for the Checkpoint exams in Grade 8 to test their skills in English, Maths and Science. This also enables them to understand individual strengths and weaknesses and choose subjects in IGCSE based on their abilities as well as interest. In Grade 10, students appear for mock examinations in March which help teachers to assess them and send the Predicted Grades to CAIE. In keeping with the ethos of approaches to learning, AGS makes use of quantitative and qualitative assessment strategies and tools that provide opportunities for peer and self-assessment. The assessment process in IB DP at AGS prepares students for the IBDP examination. The principles of assessment follow the guidelines given by IB. Each subject has different criteria which are the conditions that must be met for an expected result. Criteria generally includes knowledge, understanding, skills and presentation. Academic progress is internally assessed and IB assessment grades are given based on the following. At AGS, to maintain the high standards of academic rigor weekly summative assessment are held every Wednesday. In an academic session 2 summative assessments are held between July and December and 1 between January and April. Beside these we have term end assessments in December and May. Assessment dates are mentioned in the AGS Calendar, Almanac. Students appearing for IBDP examinations in May take Mock Exams in February-March. The Principal and Pedagogical Leadership Team accept the responsibility for ensuring the assessment policy is put into practice. Teachers and programme coordinators will communicate assessment policy to parents, and the ICT department will ensure electronic posting on the school website. The Leadership Team will regularly evaluate implementation of assessment policy as evidenced by classroom observations and school presentations. AGS Assessment Policy will be reviewed every three years or earlier as needed by the pedagogical leadership team. Reviewed : 24th July 2017 and the objective of the review meeting was to work towards a whole school assessment policy. Reviewed by: The Principal and three programme coordinators, PYPC, CAIE and DPC, along with Head of Admissions and college counselor review this policy every year. The Principal and three programme coordinators, PYPC, CAIE and DPC, along with Head of Admissions and college counselor review this policy every year. Amity Global School offers two international curricula, International Baccalaureate (IB) and Cambridge Assessment International Education(CAIE). • Grade 11 and 12: IBDP (International Baccalaureate Diploma Programme). Students from many countries seek admission in AGS, we are a flexible school and our age criterion could vary depending on the background of each child. Students applying for admission from grade 6 to grade 9 are assessed on basic skills in English, Mathematics and Science. This is followed by an interaction with the CAIE Coordinator and Principal. The CAIE coordinator guides them in subject selection. For admission into the IBDP the DPC (Diploma Programme Coordinator) looks at the past report cards with specific focus on grade 10 report card. Students are assessed informally by interaction with the subject teachers on subject knowledge on English and Mathematics. The DPC guides the students in choosing the subjects at different levels. The DPC also gives an orientation to the parents and the students about the requirements of the Diploma Programme. AGS is an inclusive school, we accept students with special learning needs and students who are non-native English speakers. Special support classes for special education needs (SEN) and English learning support (ELS) are provided. All admissions have to be approved by the Principal, who forwards them to the Chairperson, for final approval. Principal, PYPC, CAIEC, DPC, Special educator and school counselor. Special educational need (SEN) implies that a student has needs that are out of the ordinary, different from what is normal in a school. Everyone at Amity Global School – Gurugram is committed to providing the conditions and opportunities to enable students with SEN to be included fully in all aspects of school life. Provide intervention at a suitable level when a child is identified as having SEN.
Use a variety of teaching styles, and cater for different learning styles to allow children with SEN to access the CAIE and/or IB Curricula. Use resources effectively to support children with SEN. Inform and involve the parents of children with SEN so that we can work together to support our children. Encourage active involvement by the children themselves in meeting their needs. The special educator collaborates with the class teacher, single subject teachers, relevant, curriculum coordinators, parents and Principal to create an individual educational programme (IEP). AGS employs qualified SEN teachers. a) The parents wish the child to attend the school. b) The child’s special educational needs can be met by the school. c) Other pupils will not be disadvantaged. d) Resources will be used efficiently. e) The extra costs can be covered within the framework of our fee structure. The Principal and three programme coordinators, PYPC, CAIE and DPC, along with ELS teacher review this policy every year. At the time of admission all students are assessed for ELS needs. If required student is recommended ELS support. ELS classes are time tabled during the Hindi classes in Primary school. ELS students get support from the home room tutors and single subject teachers. On-going assessment and feedback is given to parents regarding the progress of students to the relevant Coordinator, Principal and the parents. Summative assessment is done at the end of every semester and reported in the report card. The ELS department collaborates closely with the HRT , relevant Coordinator to discuss the program and progress of the child. The ELS department sends a report to the Principal once the student can work independently without ELS support. The Principal informs the relevant Coordinator and parents. Develop a level of competency and confidence in using English that allows them to fully participate in social and school-based contexts. Develop conceptual understanding while developing English language skills. Develop an understanding of the learning styles and expectations of the schooling system. Ability to use strategies that facilitate the acquisition of English, and to negotiate communication in English.